While we are on the subject of gold rush era bottles thought I might relate a little information about another couple of pioneer merchants. Those little gems are real gold rush history! I would love to have dug one of those bottles. Has anyone determined how many undamaged examples of this bottle exist? Also, where have they been dug other than the area mentioned? Oldcutters, have you recovered any of these in your past travels? I have always heard they were for poison oak also, but have never seen any evidence of that. They look like jamaica ginger bottles. It would be great to see some detailed advertising for this product. I have dug two of those little gems in Old Sacramento. of course, that was back in the "olden days", long before they escalated to the exalted, and well deserved, place they now hold in collectors esteem. At that time, which was in the early 1970s, they were worth over a hundred bucks. That was not small change in the bottle world back then, either. Most whiskies could be had for little more than that, and some good ones for much less. The Manzanita bottles were produced in the early 1850s, long before trademarks were considered and product advertising was prevalent on this end of the US. I haven't seen any claims to it's medicinal qualities, but will be happy to delve more deeply into the subject. The last example that I can recall being dug in Sacramento was back in the mid-'90s when it was pulled from a pit on 12th St by A.T. Out of the many pontil pits we have dug in the ensuing years, not so much as a shard of this little jewel has appeared. I will venture to say that the Extract of Manzanita product was more popular in the Sierra's than in Sacto, and Rick's report kinda confirms it for me. For 10 yrs (1981-91), I dug almost every wknd in Sac. I dug over 1000 privies there, and at least 100 1850s holes. Never came across one of these gems, I can sadly say. The little "Manzanita" bottle can't be from the 1850s, it has curved "R"s. Just a little Saturday morning humor. 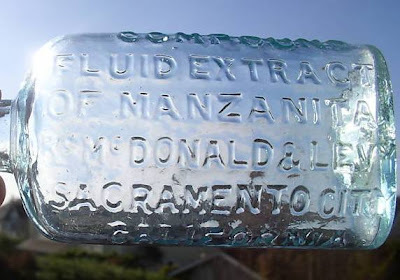 Other than a few dug from mining camps, most of the McDonald and Levy bottles came out of Old Sac, and the above mentioned one from a pit on one of the main roads out of town. Poison Oak: Manzanita berries were made into a tea and applied as a lotion for relief from poison oak. Dropsy, Bronchitis and Colds: A mixture of both the leaves and the berries was used for relief from dropsy, bronchitis and sever colds. Some sources say that this tonic is too strong to be taken internally. Stomach Problems and Weight Loss: A tea was made from the leaves of the Manzanita for stomach relief. It was also used to reduce fat. Rheumatism: A tea was made from the leaves of Manzanita for a bath to aid in Rheumatism. Headache: Manzanita leaves were boiled down into a yellowish-brown extract which was used as a wash to stop certain types of headaches. A tea was also made for the same purpose. Sores: The Concow Indians chewed the leaves of the manzanita and applied the thick pad produced as a poultice on sores.